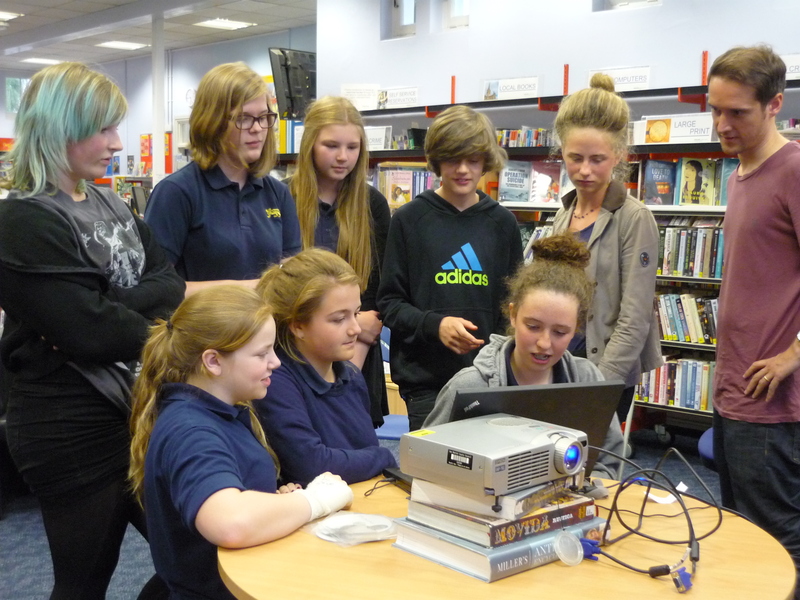 On Monday night I had my first opportunity as the new Community Development Worker at Norwich’s Millennium Library to meet some of the young people who have been participating in the WW1 Project with film maker Peter Harmer. Before the film screening I met with the group and Community Librarian, Ben Miller who has been guiding them through their Bronze Art Award, which has been an important tool in documenting and reflecting what they have learnt in a book format. During an atmospheric thunder and lightning storm, we were treated to a sneak preview of the group’s work, and what a talented bunch they are! In order to the share their work beyond the group and complete the ‘Skills Share’ element of their Bronze Award, friends and family were later invited to join us for the first public screening. The event began with a short presentation from the group. One by one, each young film maker related the diverse range of skills and knowledge they have developed through the process of creating their film; from script development to learning the lingo of film making, the group gave us a thoughtful insight into the dynamism of their experience. The film itself is beautiful, told from the varying perspectives of a family who have each had to adapt to the often distressing changes inflicted by war, and interspersed with modern day documentary links – it is a poignant and thoughtful work using a range of techniques that have allowed the group to learn more about the specific effects of the war on Norfolk and put themselves in the shoes of those who lived it. I am looking forward to working with the group in July to curate an exhibition of their work, which will be displayed in the library. The film itself will be shown together with the animation created by the TS Warriors group working on the project in Great Yarmouth in the Fusion digital gallery at the Forum from the 21st of July – as if you didn’t already have enough good reasons to visit the Millennium Library! This entry was posted in Arts projects, Uncategorized and tagged Arts Award, Earlham Library, film, Fusion Gallery, Great Yarmouth, letters, Norfolk and Norwich Millennium LIbrary, Norwich, TS Warriors, World War 1. Bookmark the permalink.